Oil price, Naira value, Employment rate and other rates might be dropping drastically, but one ‘rate’ (aspect) of the country which has virtually refused to reduce/drop, is the rate of fresh graduate pushed to the labor market almost every quarter of the year. This is no longer a surprising news. Two streams of corps members in every batches is now a norm as far as the National Youth Service Corps (NYSC) is concern. As a result, the labor market is currently the most populated market in the country, even far more populated than Aba, Alaba and all the International markets in Nigeria combined. Employment rate in the country is just too low. More worse is the fact that even the little available job opportunities in the country are not equally distributed across the Nation’s 36+1 states. 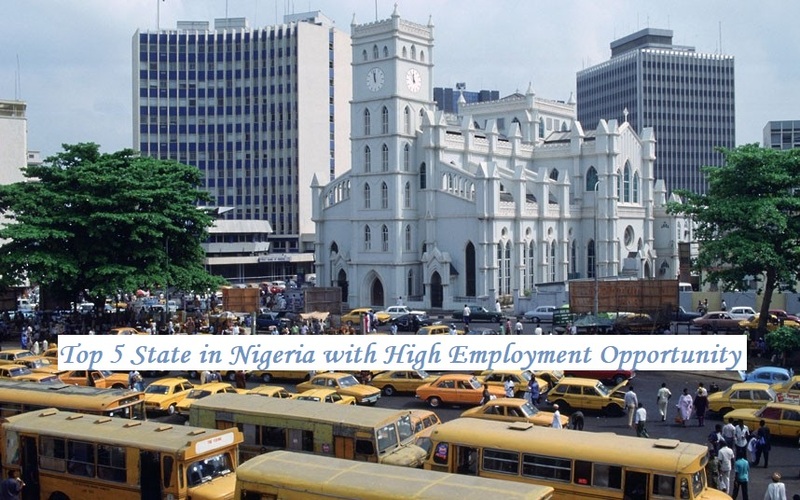 And that is why, in this article, I’ll be showing you Top 5 States in Nigeria with High Employment Opportunity. After reading through this article, I’ll recommend that every serious job seeker, should at least, have a resume with a residence address in one of these state, especially the state of your choice, that is the state you want to start hunting job in. I know someone will be asking why you should follow the above recommendation. In my next week’s edition of job tips, I’ll be sharing with you why you should not use one state’s residential address to apply for a job vacancy that will be taken in another state. Without any doubt or question asked, Lagos remain the center of Nigerian’s Economy, and the largest center of commerce in the whole Africa. In the past 7 – 9 months, Lagos state have accounted for more than 60% of jobs advertised on CareerportalNg. The interesting part of it all, is the fact that, no matter your field of study, in terms of job opportunity, Lagos state have something to offer, making the state the last resort for folks that studied stubborn courses from their higher institutions. Following after Lagos state, is the Federal Capital Territory – Abuja. It no doubt that Abuja remains the ‘landing page’ for most foreign folks, especially foreign NGOs with project to pursue in the Northern part of Nigeria. And also, don’t forget the presence of those huge, huge government-owned establishment and Parastatals. Despite all those, the benchmark set by Lagos state in terms of employment opportunity remains unbeatable. I know most of you are expecting Rivers state to be the next, I expected same, but our statistics showed the opposite, giving the third spot to Borno state, Nigeria. Wondering why? Well, the answer is not far fetched, NGOs! The consistent Boko Haram insurgence in the northern part of the nation especially Borno state, has drawn the attentions of both indigenous and foreign Non-governmental Organizations to the state. Currently, there are above 20 indigenous and foreign NGOs, actively recruiting for various projects in Borno state, bringing the state to the third spot on our lists of Top 5 States in Nigeria with High Employment Opportunity. Yeah, now to the Nigerian oil depot – Rivers state. Want to pursue careers in the Oil and Gas industry, then you better start hunting jobs in Rivers state. That however, does not mean that the only available job opportunities in Rivers state is in the oil and gas sector. You can find career opportunities of varying categories in Rivers state as well, and below is the list of job vacancies currently available in Rivers state. The Last but not the least, is Oyo state. To be more specific on that, I’m referring to Ibadan, because 8 out of ten vacancies in Oyo state is taken in Ibadan, the state capital. In fact, this is not just the case of Oyo state alone, all the aforementioned states are characterized with more job opportunities in the state capital, and few scattered among other local government of the state with exception to Borno State. Like I said earlier, if you are a serious job seeker, start hunting jobs in the states mentioned above, and you should really start now, especially serving corps members. I’m not saying every single job seekers out there should relocate to the above states from the whole 36+1 states in Nigeria. But just add a bit more diligence to your job hunting tactics. Don’t confide yourself to finding jobs in your state or locality alone, lunch out your CV’s and resume to any of the above states with more employment opportunities, and as you do that, consider my earlier recommendations. When applying to a job available in any of the above state, or another state outside your state, please consider using the address of the state where the job is going to be taken in your CV or resume. You may have a brother or friend who resides in such states, ask them to give you a detailed address so you can include it in your CV. Also try and memorize the address in case luck shines on you, and you get called for a phone interview. Do let me know what you think in the comment section below.